Forget all those linear voltage regulator designs I posted previously for the Sunbeam Kubota alternator conversion. The error in my thinking is that an unloaded inductor produces high voltages, which must be dealt with by dissipation as heat. My linear design, while still within its design limits, was really overheating cooped up in the box. It was experiencing too high an input voltage than I planned. And it was too ugly to mount outside. So now I know why they use a shunt regulator. It collapses the voltage reducing the power that must be dissipated. 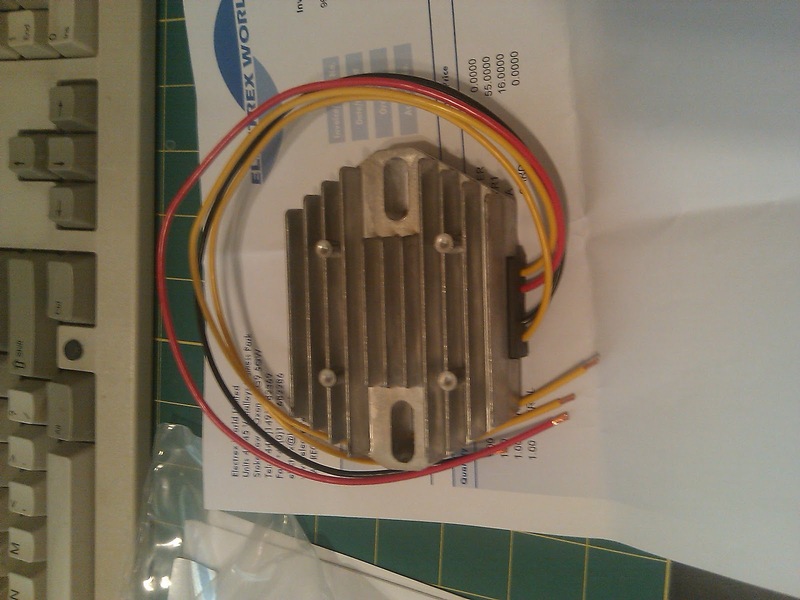 Thanks to Electrex World LTD for having model RR-1 in stock, and for the quick shipment. 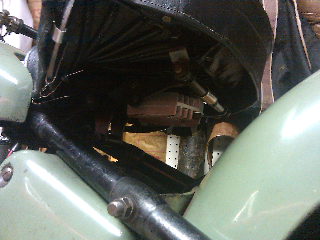 I made up some clips to go around the seat bolts, and fastened the regulator neatly under the seat out of sight. With some spare BSW bolts! It will also get some air flow. All the original bulbs are back in place, and I'm ready for a test.... as soon as it stops raining. Initial indications are that the regulator charges strongly. It doesn't appear to be over the battery rated charge current, and I'm hoping the bulbs will assist in keeping the voltage load regulation in check.